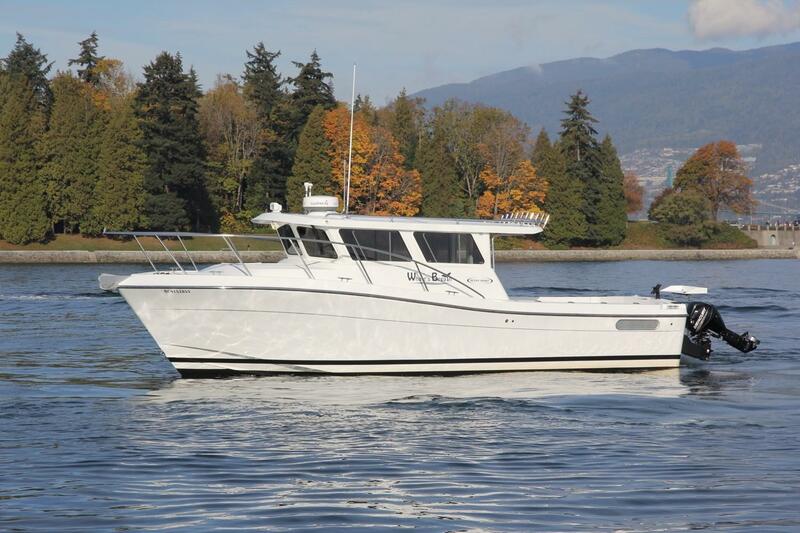 The Ocean Sport 33 Roamer is a twin diesel sport vessel designed with the outdoor adventurer in mind. Whether fishing, diving or exploring the more remote stretches of our coast, Whale's Breath will deliver. 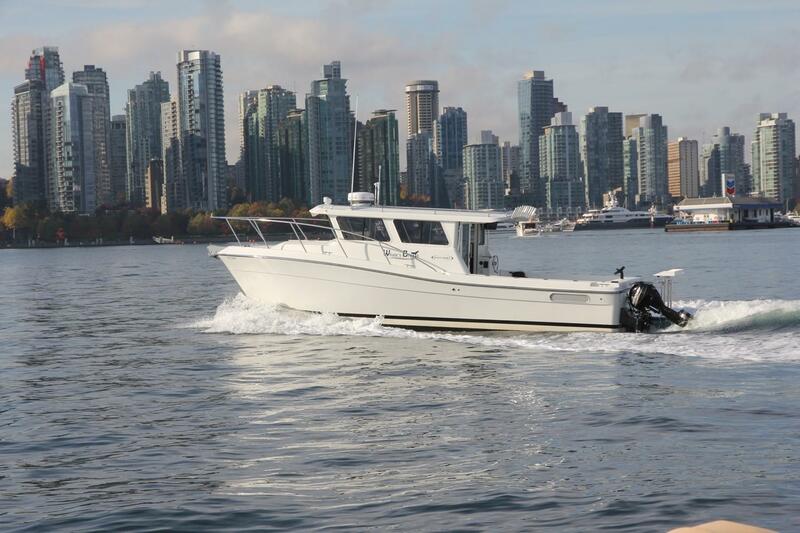 Simply put, the incredible cockpit, all weather design, extended cruising range, and accommodations for up to six will bring any West coast adventures within reach. The Ocean Sport 33 Roamer series has a simple, intuitive design, classic Northwest lines, and a no-nonsense approach to function and layout. The design is by Jim Lindell, renown for understanding our unpredictable waters, and the needs of boaters in our area, and was manufactured by the Jim Lindell team, whose skilled craftsmen have taken the Roamer to the next level with resin-infused construction, experienced attention to detail, and high quality workmanship. The design is proven. A modified vee hull with a sharp entry, deep forward sections, and 20 degree dead rise as the lines moves aft. 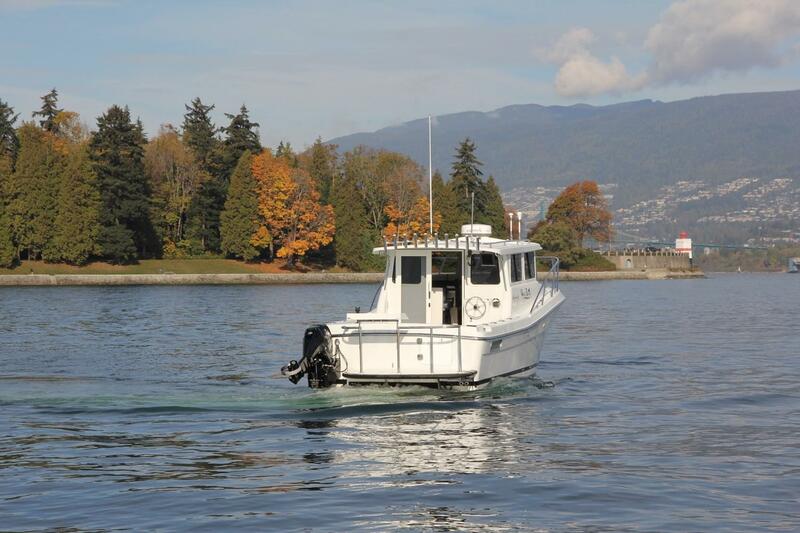 The result is a level ride, superb performance, great fuel efficiency, and a stable platform through a variety of conditions, including a quartering or following sea. 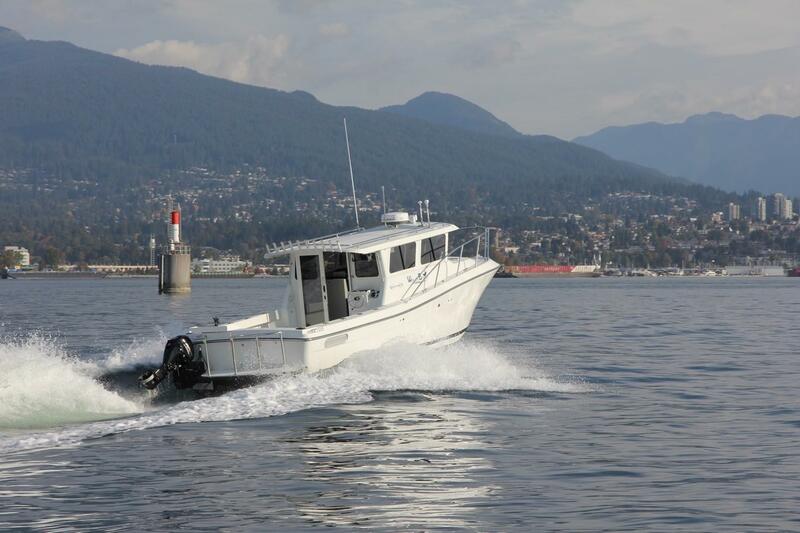 This Ocean Sport 33 Roamer is set up to zoom out to your favourite fishing grounds, fish and explore for days at a time, relax in comfort in the evenings, and zoom home again whenever it suits. 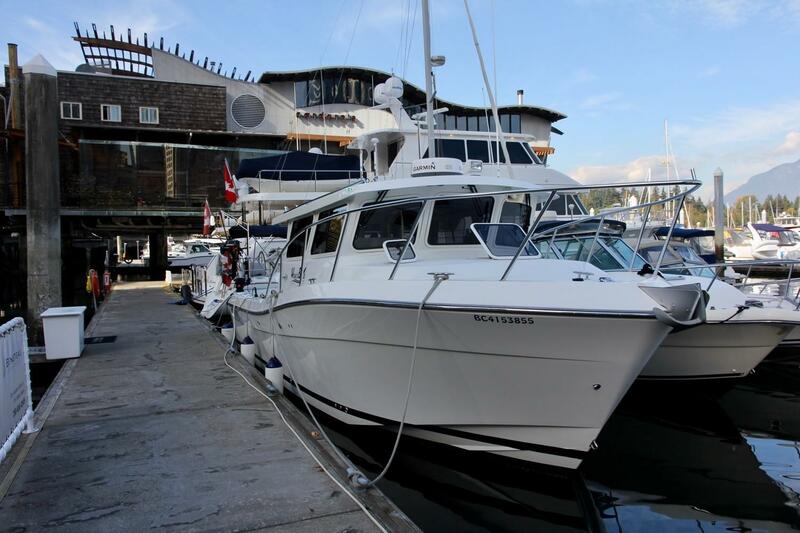 She has always been serviced regularly, and stored on the hard indoors each winter. The owner is very sensitive to the importance of air circulation through the vessel when not in use, and has taken steps to improve airflow. Small but important steps like this help contribute to this very clean, zero-smell, mildew-free boat! 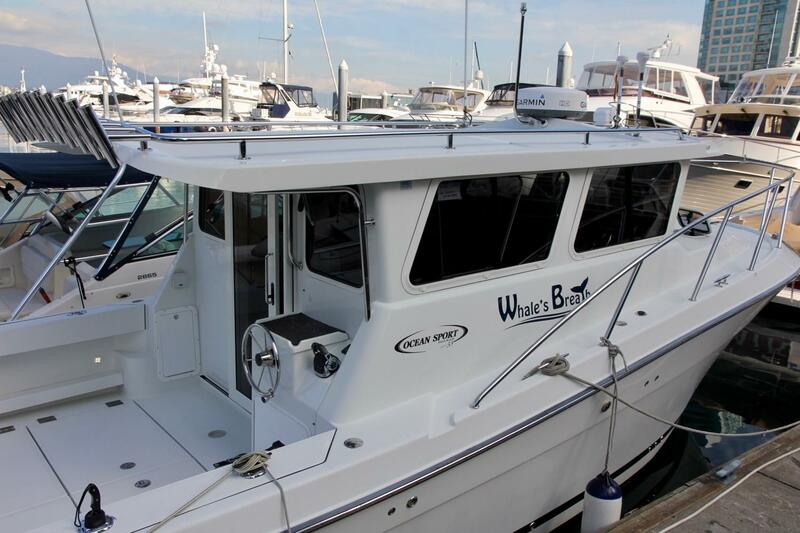 Whale’s Breath is being offered now by a meticulous yachtsman, and is in excellent condition throughout, with a superb options list, up-to-date maintenance, and plenty of spares. She is ready for new adventures! 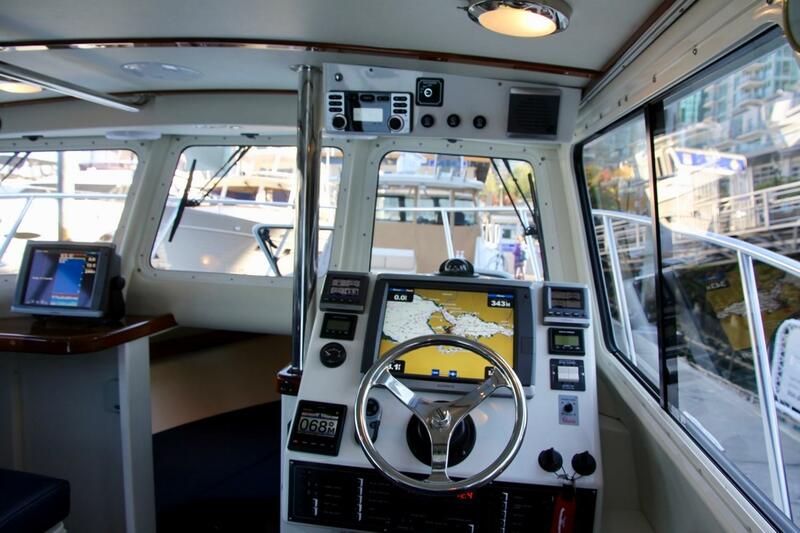 The cockpit is vast, with room to accommodate four to six anglers moving about freely. 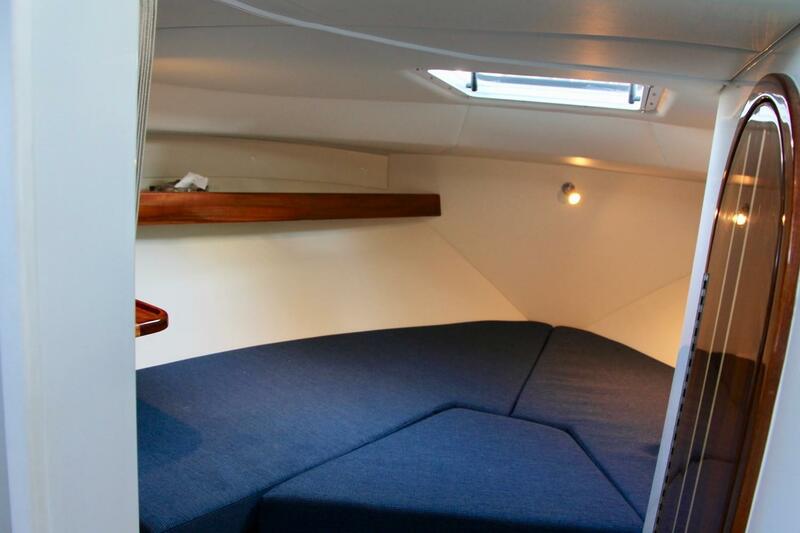 And there is plenty of room for a table and deck chairs, for relaxing after a day on the water. Board over the gunwale, or via the opening door in the transom. Movement to the foredeck is safe and easy with a step up from the cockpit, to a fair size side deck, and beefy hand rails. Enter the interior by the sliding door in the cockpit. 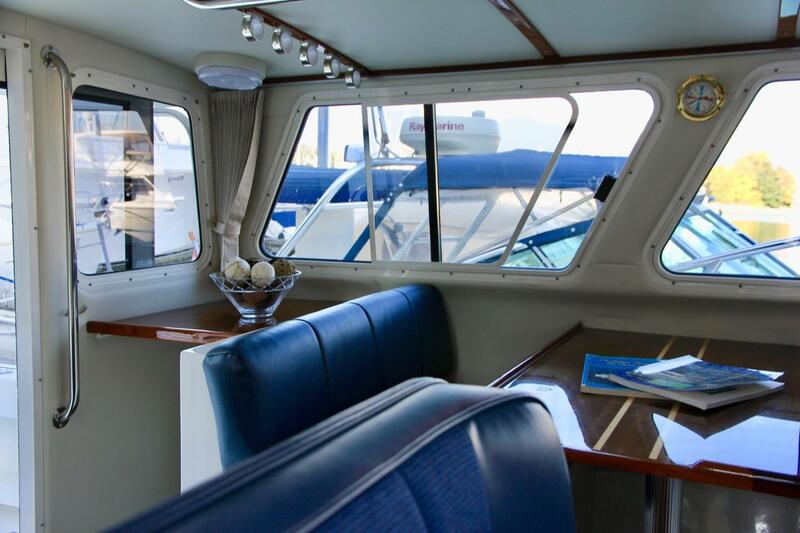 There is a guest cabin immediately down to port, the fully-found galley to starboard, a settee with dining table to port, with an adjustable aft or forward facing settee, the helm forward to starboard, and the owner’s cabin forward with private head and shower. 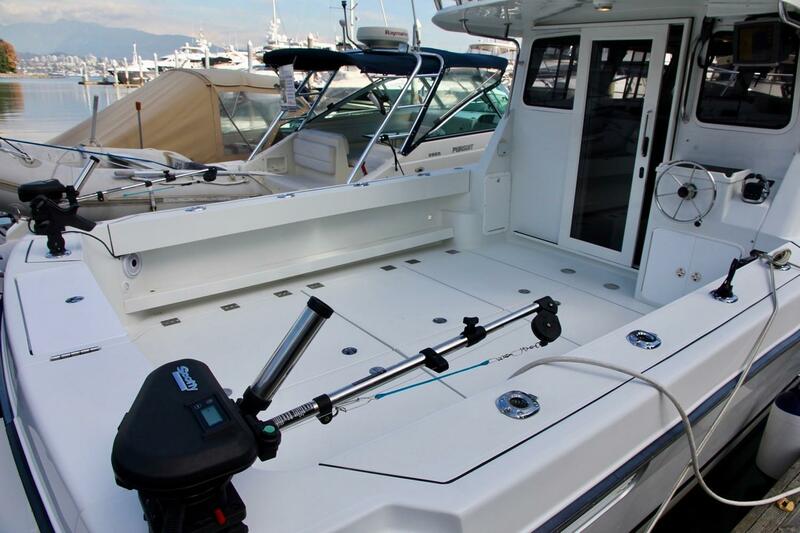 There is tremendous storage throughout the boat. The owner reports that four men can stow all their gear and food for four or five days in the storage lockers, leaving the living spaces clear for, well, living. Cabinetry and drawers are of teak, with a durable gloss varnish. The Ocean Sport 33 Roamer has sleeping accommodations for up to six adults in two cabins and a convertible salon settee. 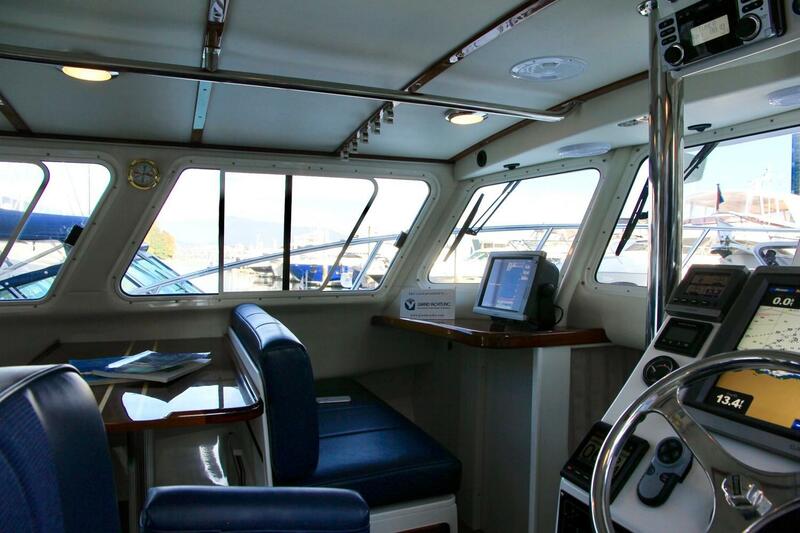 There is a guest cabin located midship to port, accessed via a couple of stairs from the galley area. 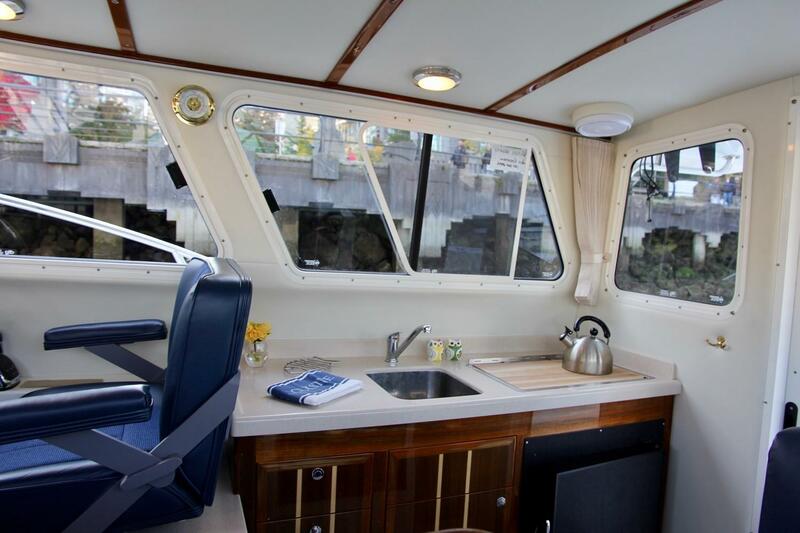 There is a large double berth, measuring 7' 5" x 4' 8", lights, hooks, a shelf, and a closure for privacy. 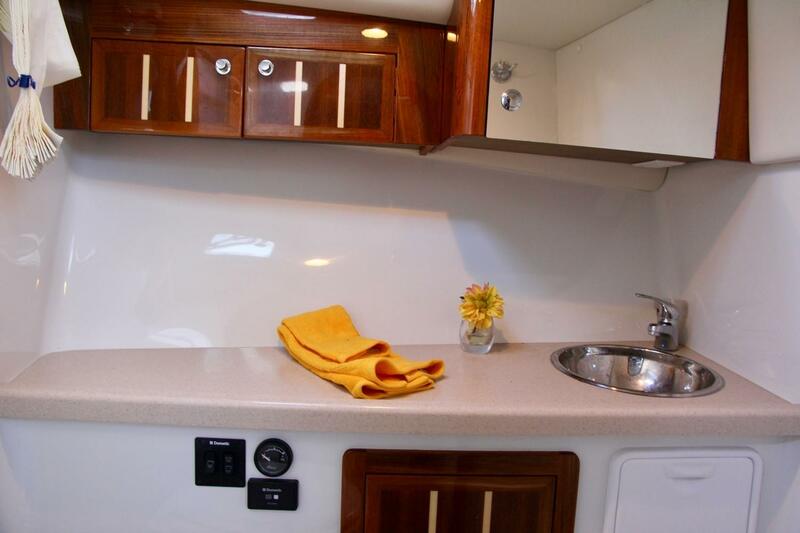 Forward is the main or owner’s cabin with a large double V-berth, 7' 6" long, with insert, hanging locker, storage shelves, overhead lights, opening overhead hatch with screen, port lights with screens, and numerous storage lockers and drawers. 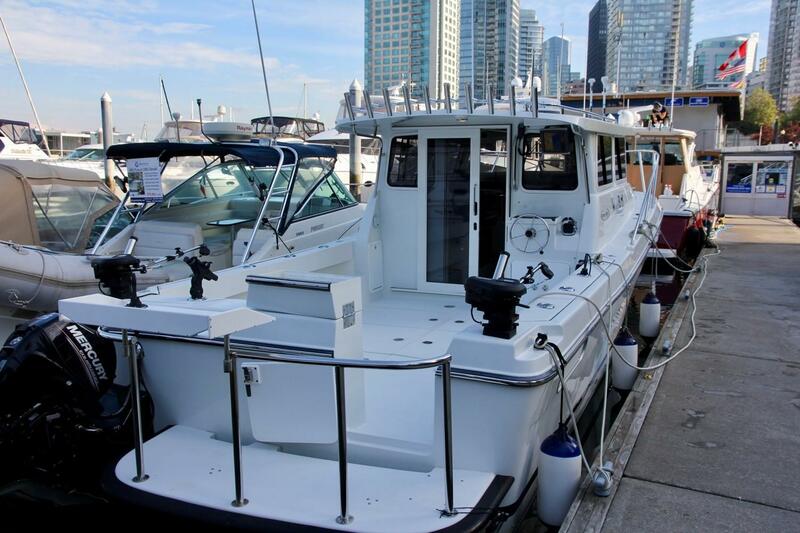 The private head is to starboard with electric marine toilet, basin, storage lockers, and shower with dedicated sump and pump. The shower has never been used except to hang and dry foul weather gear. Natural light fills the salon with large windows all around. There are curtains for privacy, and four of the windows open broadly giving plenty of fresh sea air. 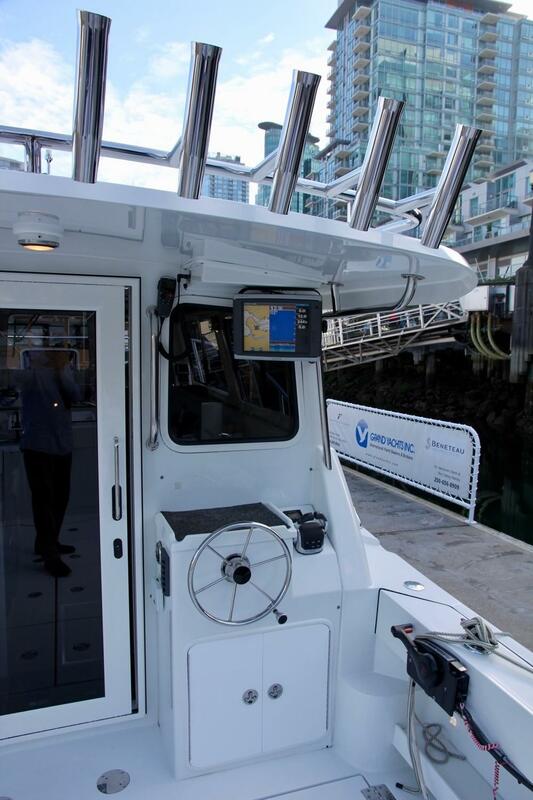 Three of the four opening windows have screens, but not one for the helm, allowing the operator to lean out unencumbered as needed. 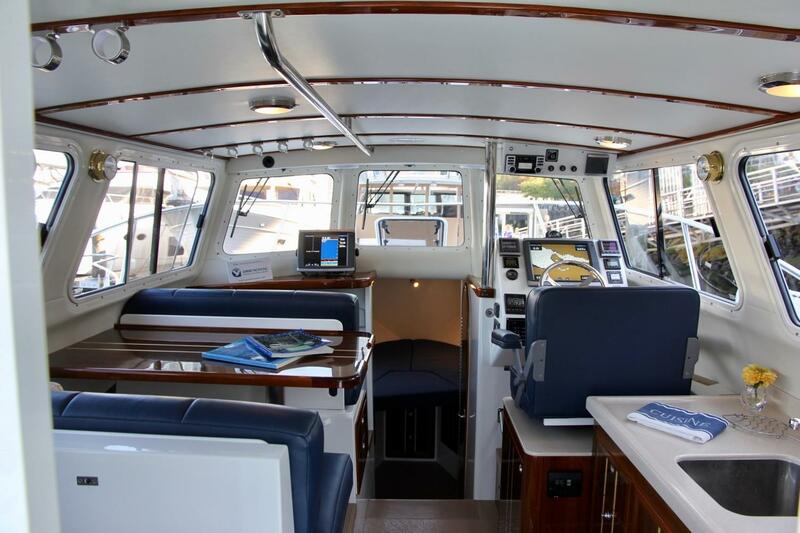 To port is the dinette with fore and aft facing settees, storage under. This settee drops to make a third double berth. The floor is of rubberized tile for durability, non-skid, and for easy cleaning. 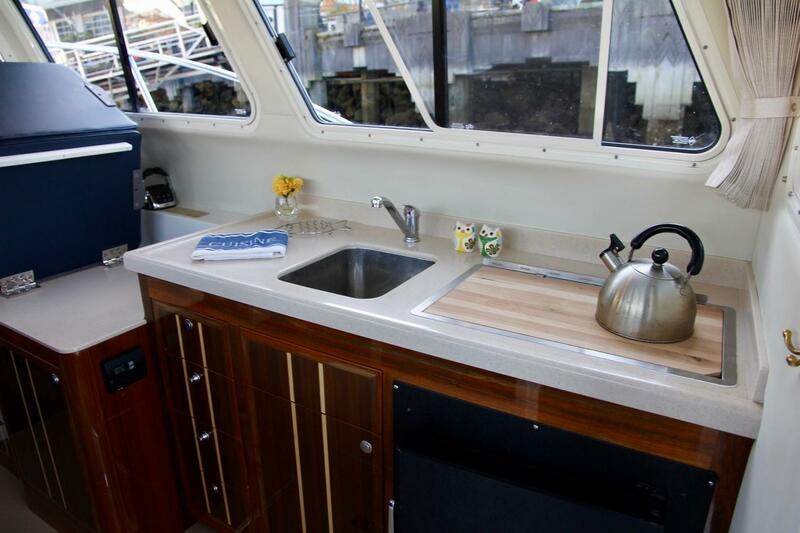 The galley is to starboard, and although a little compact, the cook has all the elements needed to create and impress. It is adjacent to the salon. 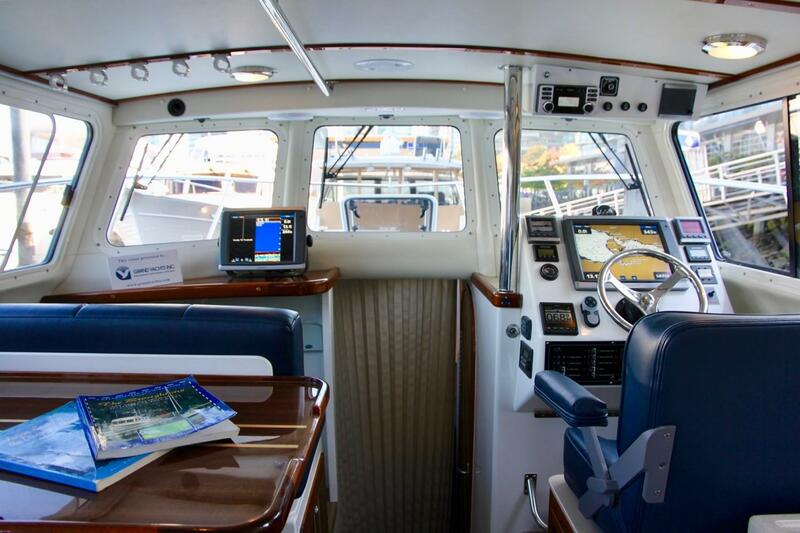 From the helm is a commanding view all around the boat with excellent visibility for the operator whether sitting or standing. All controls are close at hand. The cockpit is huge, measuring 11' 6" x 8' 6", (12' 0" x 9' 3") and would be the defining feature if not for the comfortable interior! 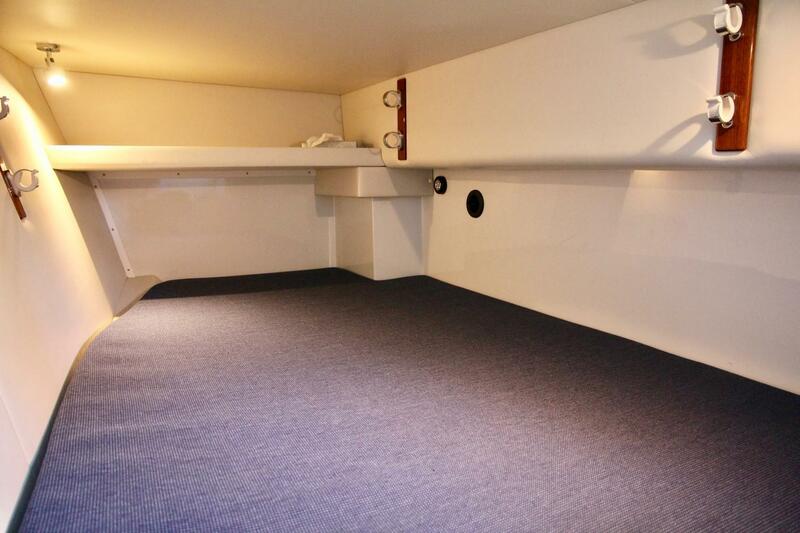 Not only huge, but thoughtfully appointed and well laid out with storage lockers and shelves both above and below decks. When not in use at the cockpit station, the 12” Garmin unit can be moved indoors to the co-pilot’s seat and plugged in to the network. AC and DC power systems service the vessel through circuit breaker panels with appropriate voltage and ampere gauges. 110VAC is provided by 30 Amp shore connection, and, based on available house bank battery power, through the inverter. 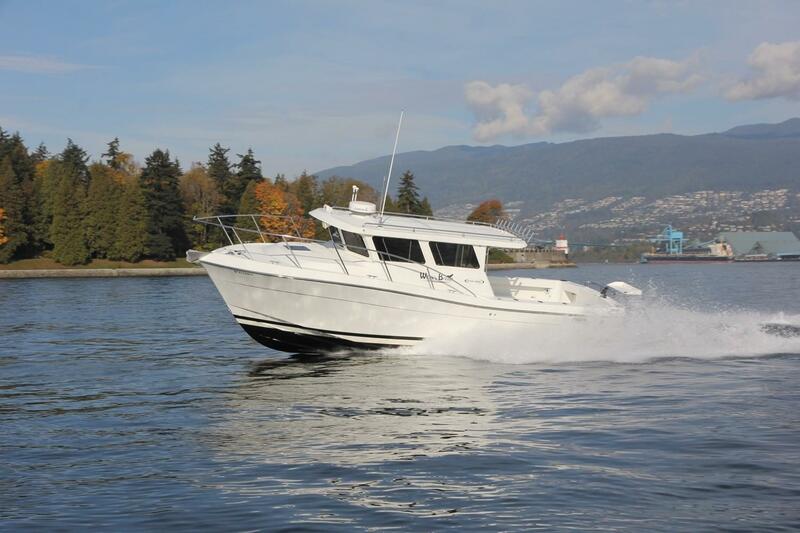 Powered by clean, quiet, reliable, and efficient twin 260 hp Volvo D4 common rail diesel engines with Volvo DuoProps. Regularly serviced by authorized Volvo technicians, and always ready for cruising. The machinery space is broad with room to access all areas of the engines. Whale's Breath comes with a good inventory of spares, all catalogued, including pumps, props, impellers, belts, zincs, filters and more. However, designers and builders striving to achieve better performance would be very cautious of added weight, and hence find ways to build a lighter boat, reducing the horsepower needed to achieve efficient cruising speeds. But of course, they must strike a balance between light weight, and strength ensuring a safely constructed vessel, that will stand the elements of the sea, and the test of time. In simple terms, the strength comes from the glass fibres, and the weight comes from the resins. The trick is to use an adequate, yet minimal amount of resin for a given amount of glass fibre. The best way to achieve this is by the resin-infusion method, which results in a much higher strength to weight ratio than the hand-lay up method. The hand lay up method is absolutely perfect for certain applications, but it can add unnecessary weight when trying to achieve higher performance. The Ocean Sport Roamer is constructed using all a vacuum-bagged, resin-infused hull and deck layup, with a Corecell sandwich. The end product is a supremely stiff, exceptionally strong vessel. 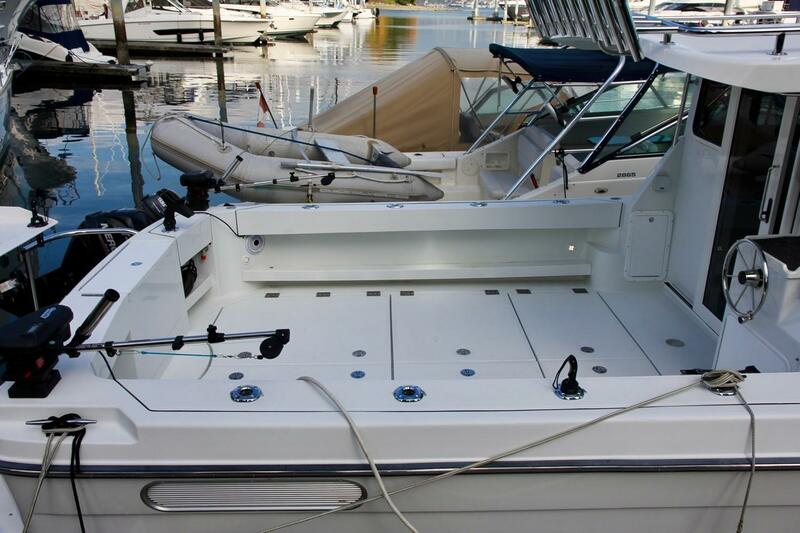 Polyester resins are typical in most boat construction. 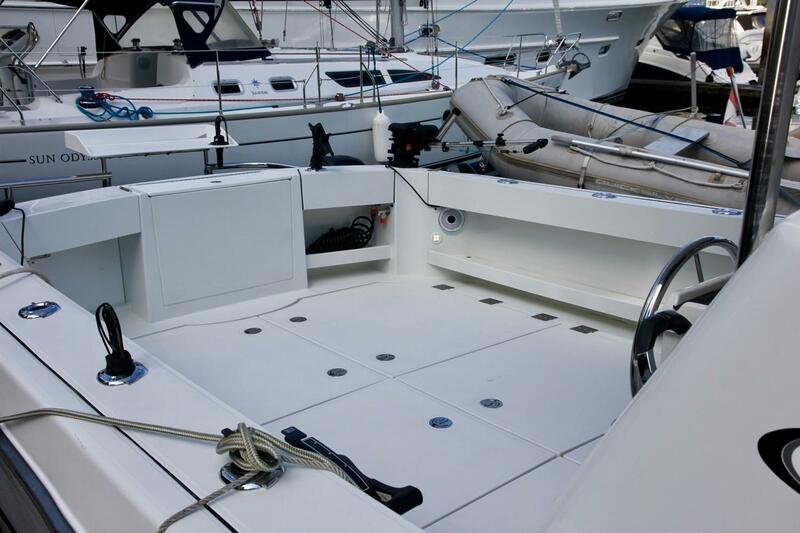 Ocean Sport Roamer uses the more expensive vinylester resins for all structural components. These resins give superior resistance to abrasion and blistering, and post-cure shrinkage, meaning the gel coat will look new for many years. Ocean Sport is constructed using bi-directional E-glass fibers which has more strength than uni-directional glass fibres, and they use Corecell in the sandwich, adding torsional stiffness, and improving thermal and acoustic insulation. The outcome is a stronger boat, a lighter boat, and a boat that will last longer, look good longer, overall increasing its long-term value! Hi there, I would like more information about the Ocean Sport Roamer 33 by Lindell.